Our experience, good and bad, with suppliers and services. It has been six years since HydraPower Hydraulics built a beautiful custom hydraulic cylinder to give us complete control over our Reef-Rite boom furling mainsail. ADAGIO’s “hydraulic spring” boom-lifting system was designed by engineer Chris Mitchell. This earlier post summarizes the design. Because the hydraulic system has worked flawlessly since installation we had never actually used the manual hydraulic pump to pressurize the accumulator and cylinder. When I couldn’t figure it out on my own I twice rang up Paul Lamont at HydraPower Hydraulics in Christchurch with questions. Paul quickly accessed the original design drawings for our system, then stepped me through the correct process for re-pressurizing, bleeding the cylinder. That’s the sort of customer service that makes us smile! If you use a lot of satphone minutes within a 12 month period, then pre-paid minutes will likely be the cheapest per-minute air time. Typically around USD $500 for 500 minutes (which expire after 12 months). We use very modest air time, so what works best for us is a “pay as you go” plan. The best plan we have been able to find is the “Casual Plan” offered by Australia’s TR Telecom “Iridium satellite call plans Australia “[PDF]. There is NO activation/cancellation fee, but there is a four month minimum at AUD 30/month, which includes $10/month call credit. Any time after the four months minimum period, we have the option to cancel when we are done passaging, or to suspend service, for AUD 15/mon — which allows us to keep the same number. Air time for voice calls is AUD 1.98/minute. We have hard-mounted our Iridium so it has a high gain external antenna and is always on the charger and always connected to the serial-USB hub if we need to download e.g., a GRIB and Steve isn’t willing to wait until propagation improves. If we need to make a voice e.g., med emergency call we have to sit on the port hull steps 🙂 We use Sailmail (or Winlink) first, Inmarsat-C second, Iridium third or for data too big for Sailmail. If we wish to get a quick note off to our weather router, Rick Shema, we just use Sat-C because the msg is short, and we know we will get an alert soon as Rick’s msg comes in. The following is a softened summary of the bad Panda genset news. The good news is that the customer service and support of our supplier in New Zealand has been absolutely first-rate — that is Enertec Power Solutions. Enertec also supplied all of our Mastervolt chargers, DC-DC converters and 230V inverter. Because we have had problems every year over the past ten years with our Panda 10kW genset, we have emailed or phoned dozens of inquiries to Enertec, who have always supplied prompt, expert, relevant support and guidance — especially from Colin Pawson and Maladen Bartolec. From them we have compiled a trouble-shooting guide that usually helps us fix the Panda beast ourselves — in remote locations of course. That was the good news. For two months we’ve been immersed in dealing with the catastrophic failure of our Fischer Panda generator. There is a serious design fault in our Panda, which appears to be present in both the smaller and larger Panda models owned by other yachts we know. In particular, our asynchronous alternator housing has the windings harness exiting very near the bottom of the casing. To my astonishment there are no water tight seals, not even a basic $2 gland – just a roughly 50mm hole in the aluminium casting. Therefore, any significant seawater leak in the genset plumbing can fill the sound shield to a level where the seawater enters the alternator casing and infiltrates the windings. In our case in less than 5 minutes that seawater flood fatally damaged the alternator winding insulation. Our flooding and alternator damage was caused by the complete failure of the Panda-supplied GEM hose clamp securing the heat exchanger seawater-out hose barb. The GEM hose clamp sheared across it’s width. Worse, none of the Panda hose barbs were double-clamped as they should be. Most of the Panda-designed hose barbs are so short that it is nearly impossible to double clamp safely. Given the very real probability of seawater faults it is very clear that the alternator must be protected from seawater damage. Similarly, there is a serious fire risk for any seawater leak which results in spray falling on any unprotected wiring or terminations. So not only the alternator requires at least IP-66 protection, so does all of the wiring vulnerable to seawater faults. And obviously, all of the seawater hose connections require double hose clamps of highest quality. We have replaced all the Panda hose clamps with double ABA all 316 clamps. Similarly the exhaust hose barbs are secured with Mikalor all 316 stainless T-bolt exhaust hose clamps. Though the catastrophic failure is entirely the fault of Fischer Panda, they take no responsibility, and want NZ$ 7,000 just to deliver a replacement alternator assembly (no labour, just the destroyed part — so realistically to fix Fischer Panda’s gross design problem would have cost us a minimum of NZ$10,000 using Panda parts). Our only other official Panda option is to buy a new genset for NZ$ 23,000 + deinstallation and reinstallation costs. So we had no practical alternative other than to send the alternator off for rewinding, and the Kubota three cylinder diesel off for new rings, valve lapping and other upgrades that we hope will help the diesel perform through the 7,000 hour mark. This is not intended to be a thorough review of the Fischer Panda marine generator. That would require many more pages and more time than I have. If you are buying a generator (or a boat with a generator) you do not want a Fischer Panda UNLESS you absolutely must have a physically small, lightweight generator. If you have the space for a larger generator and can afford, per kW, close to double the weight of the Panda, you will be far happier with a reliable, old-fashioned generator such as the 1500 RPM Northern Lights. It is a heavy monster, but very simple and far less likely to fail. On 16 February we emailed 3M New Zealand with our problem report of the adhesion problem we experienced with the new clear non-skid. Two days later we heard back from Auckland-based Carolyn Parris, Senior Technical Specialist. Carolyn took on our problem as her own, following it through the 3M customer service channels through successful resolution. It became clear that the adhesive failure was due to a rare defective batch (that’s not proven but we think is the most likely explanation). After consulting with 3M engineering, Carolyn recommended replacement of the clear product with the black version 3M Safety-Walk Tread (just to be sure we had all weapons deployed in the battle against UV damage). Carolyn then arranged for Brent Dobbe at Anti-Slip Solutions NZ to drive 2.5 hours north of Auckland to ADAGIO where we were berthed in the Whangarei Town Basin Marina. Brent did a first-rate and very-long full day of removal and reinstallation. The new black 3M Safety-Walk Tread looks very smart on the eight reworked hatches. Our bottom line on this experience: ADAGIO continues to be a happy and loyal 3M customer. That is why excellence in customer service is so important – a principle adopted at 3M long ago. So we just purchased another 60-ft roll of the 3M non-skid to redo our remaining eight hatches that are still protected by ten-year old 3M Safety Walk Tread (but getting a little tatty cosmetically). As you can see in my email query to Facet-Purolator, we wanted to install a 12 VDC solid state Facet fuel pump in an unusual configuration — as an emergency primer pump that would be sitting on our engines diesel fuel supply 99.99% idle. I.e., if the pump restricted flow, especially if only under odd/rare conditions, it could be very bad news. I think customers need to know who the star-class vendors are. A quick on-point answer; a recommendation for a superior solution; and a referral to friendly local help. You scored 100% plus bonus points for customer service excellence. (…) I have a new Facet fuel pump in my hand and am about to install. Message: This is a “tech support” question, which I am submitting from New Zealand aboard our yacht ADAGIO. As part of redesigning our inline duplex Racor 500FG diesel filter arrangement, I want to incorporate an electric fuel pump to facilitate emergency repriming of our two Yanmar 3-cyl turbo diesels. E.g., one of the line of Facet CUBE pumps. My idea is to just switch on the pump for repriming, so 99.999% of the time the pump is OFF. This saves a lot of effort and expense of valving the pump IN/OUT of the fuel line. My question: if I permanently plumb in the appropriate Facet solid state pump, between the outlet of the Racor filters and the fuel distribution manifold, will the pump present any meaningful resistance to the fuel flow when the pump is not energized? Our fuel flows are very small — the maximum consumption rate is about 16 litres/hour. If the return volume is 80% then the gross flow rate is 80 litres/hour or 1.33 litres/minute. I was thinking of ordering the 40108, but that may be ridiculous overkill. Here in New Zealand, none of the Facet dealers I’ve contacted know what the restriction of these pumps might be. No problem you can use many of our Cube solid states pumps for your application and there will be no significant flow decrease when the pump is turn off. There are many OEM installations just as you stated. However I believe the 40108 is an over kill and a 40106 will work just fine. I have a distributor in Australia/New Zealand that can help you. Please contact Mick Ryland at <excised> at ashdown-ingram.com.au and he will be happy to help you. For years we have enjoyed superb nonskid performance from the 3M Safety-Walk Tread. Until we tried the new 2″ clear version which we applied June 2009 before sailing back west across the Pacific from San Francisco. Just 10 weeks after painstakingly careful installation the new tape was failing – first the edges lift up, then the whole tape section peels off leaving just the adhesive. As always, click the thumbnail for the complete photo gallery. UPDATE: by the time we made landfall in New Zealand some 90% of the new clear tape had fallen off. 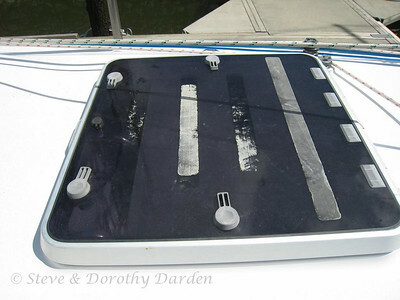 But the same 3M tape in grey we also applied to one hatch was still essentially perfect (also applied) in June 2009. Is this just a bad batch problem? Or is the clear version not suited to be used outdoors? UPDATE: our adhesion problems were completely resolved by 3M New Zealand. See this March 2010 post for our experience of excellent 3M customer service.